Biometra TRIO | Tamar Laboratory Supplies LTD. The Biometra TRIO from Biometra, is the only instrument that provides three independent blocks and heated lids in one housing. Thanks to the multiblock technology three different independent protocols can be run in parallel. The Biometra TRIO offers high throughput in parallel operation (up to 144 x 0.2 ml samples) in combination with the flexibility to run different protocols. This makes the Biometra TRIO Thermocycler the perfect instrument for laboratories with the demand for high flexibility and the need often to optimise new PCR-protocols. By the elegant housing with improved air stream design and the complete new hardware architecture the Biometra TRIO achieves higher heating and cooling rates. High ramping rates provide both short experimental times and increased specificity. The airstream is especially guided to efficiently cool all sources of heat emission and is exhausted to the rear. Therefore the instruments can be placed directly side by side. In combination with the compact footprint of only 30 cm x 38 cm valuable bench space is saved. 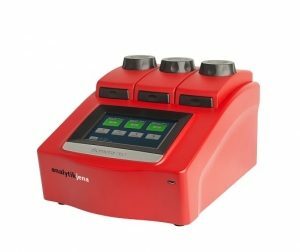 To find the optimal annealing temperature of new primers pairs the Biometra TRIO Thermocycler offers the new Temperature Optimisation Step function. Temperature Optimisation Steps, by making use of the three blocks, provide different annealing temperatures in a gradient-like fashion. In the corresponding screen just enter an annealing temperature for the block in the middle and an increment, defining the temperature difference for the first and third block. For maximum ease of use programs containing Temperature Optimisation Steps automatically start on all three blocks, there is no need to start and stop the blocks individually.